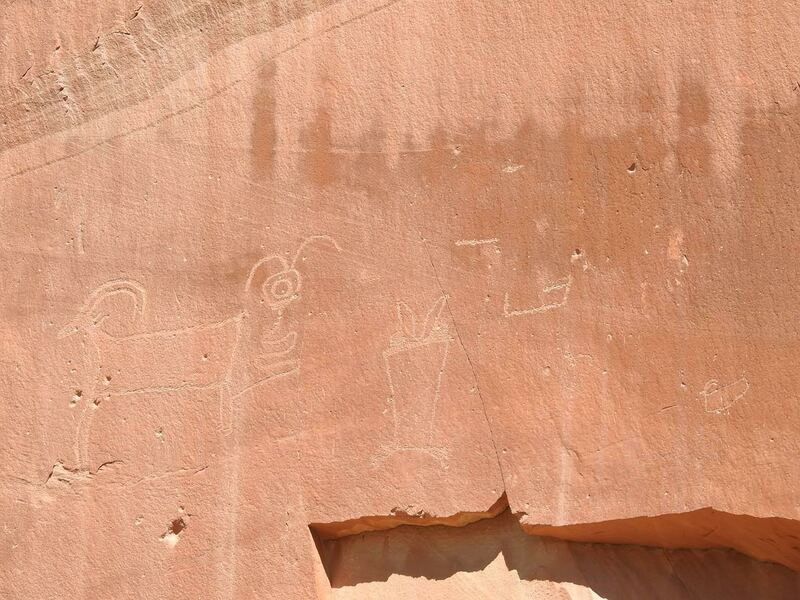 “It looks like a spaceman eating fries,” said more than one child, looking at the petroglyph, below. There were petroglyph panels throughout Capitol Reef National Park, and this one was along State Route 24, in the five miles between the teeny, tiny town of Torrey, Utah and the entrance to the park. They’re circa 600-1300, made by the Fremont, a (mostly) hunter-gatherer people. 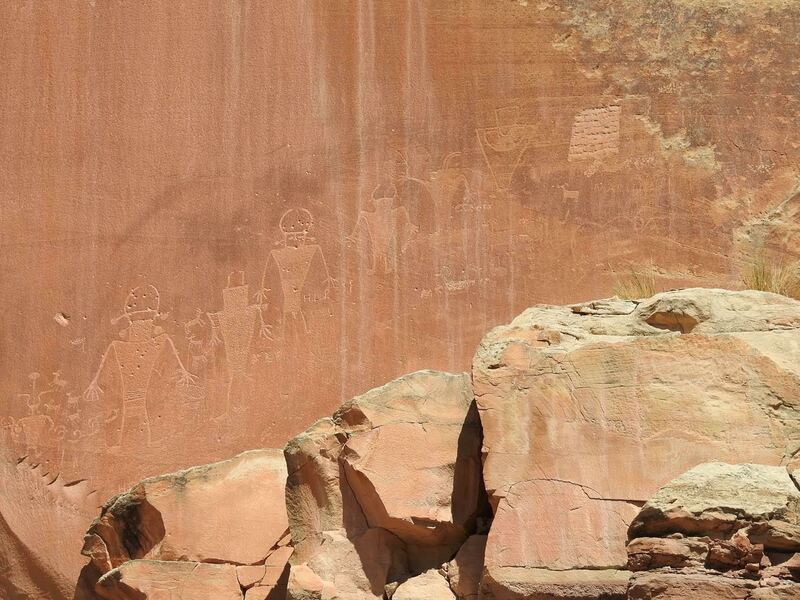 Many of the petroglyphs show hunting scenes, but the kids are right — the hunters look an awful lot like they wandered in from Area 51. Capitol Reef National Park was our stop after Canyonlands. Its visitor pamphlet says that its “defining geologic feature is a wrinkle in Earth’s crust, extending nearly 100 miles from Thousand Lake Mountain to Lake Powell.” The wrinkle manifests as a narrow canyon, named Waterpocket Fold. 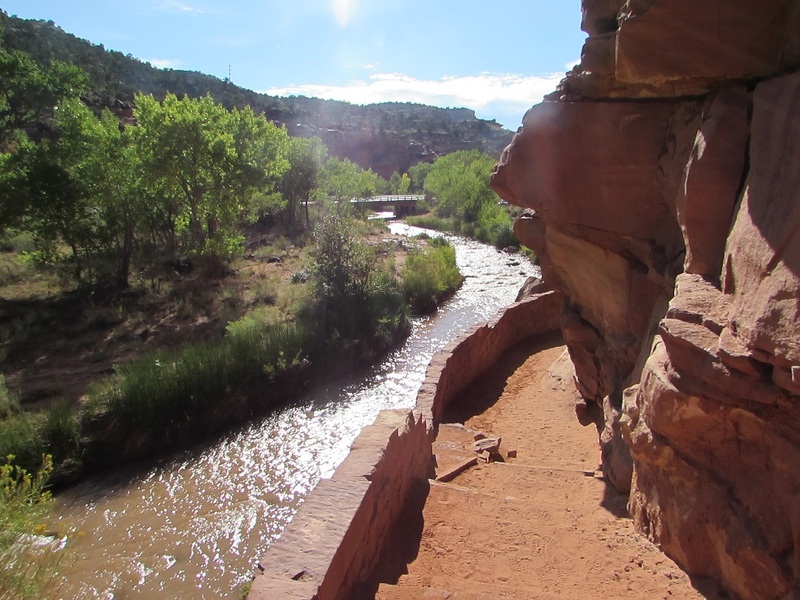 The “reef” of Capitol Reef comes from the that wrinkle — early explorers apparently called the canyon a reef “since it was a formidable barrier to transportation.” Hmmmm. The “Capitol” comes from one of the white Navajo Sandstone domes that dot the park, because someone thought it looked like the dome of the US Capitol building. I don’t have a photo of that particular dome, but here are some other sandstone domes, which are more Hershey’s Kiss than dome. We did two hikes while we were at Capitol Reef, both a little over 2 miles. One was the Rim Overlook trail (marked “strenuous” on the trail map but it really wasn’t that bad), with views into the valley below, and the other was the Grand Wash Trail (flat and easy). 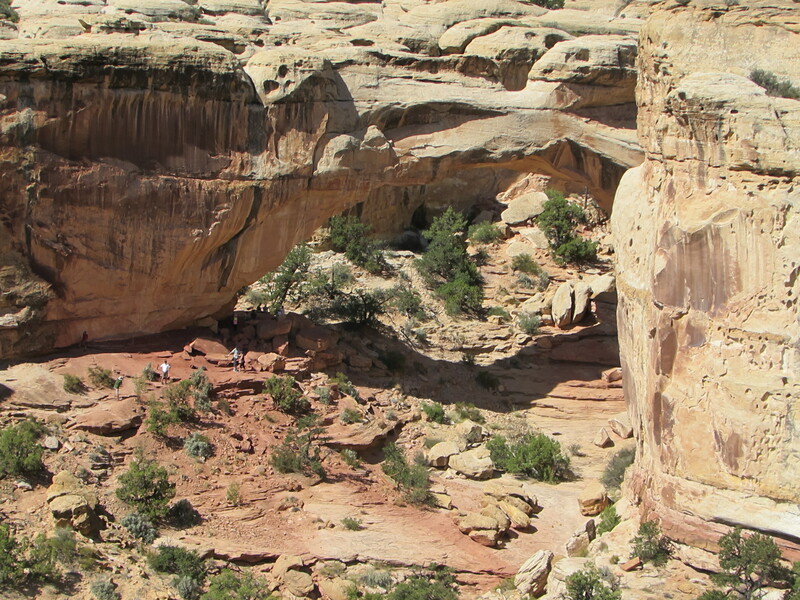 The photo below is of the Hickman Bridge Arch from the Rim Overlook Trail. There’s a separate trail that goes under the arch. 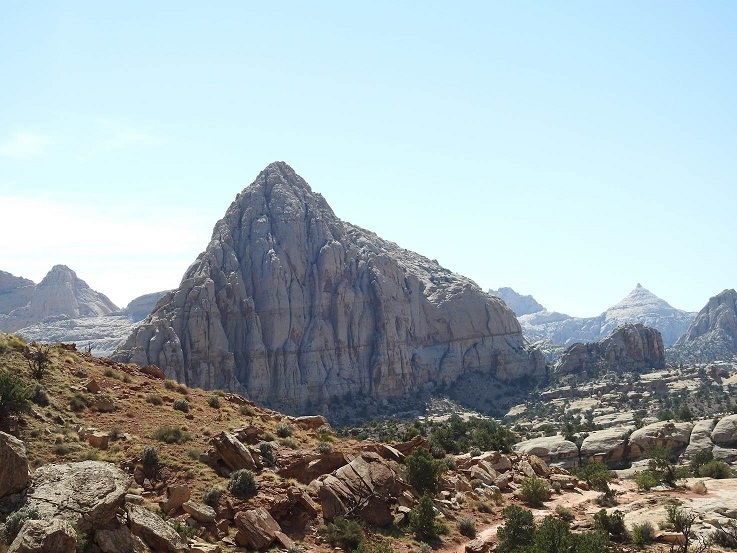 The Rim Overlook trail ends with a — surprise! — overlook looking down at the Fruita Rural Historical District. The first white settlers in the area came in the 1870s and started a farming community next to the river. Eventually the community, known for its fruit orchards, became known as Fruita. In the 1960s, the National Park Service bought all Fruita property still in private hands, and it became part of Capitol Reef. Most of the structures in the community were razed, but the orchards (with about 3000 trees) still stand and are maintained by the NPS. When we were there last month, it was peach season. Visitors are welcome to pick and eat any of the fruit, and what you eat there is free. If you want to take some away with you, however, you have to pay a nominal fee. The last family to leave Fruita was the Giffords, who sold their property to the NPS in 1969. 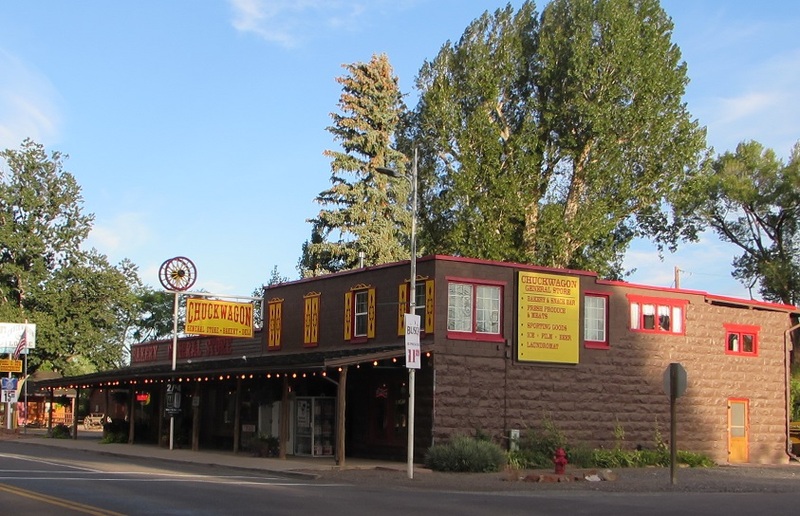 I’d read, in several different articles, that the Gifford House (built in 1908) was now an NPS store, and that the store sold delicious cinnamon rolls the size of my head. Cinnamon rolls are my guilty pleasure so I was really looking forward to getting one. But, in the biggest disappointment of the trip, they were completely sold out by the time we got to Fruita at about 2 pm. 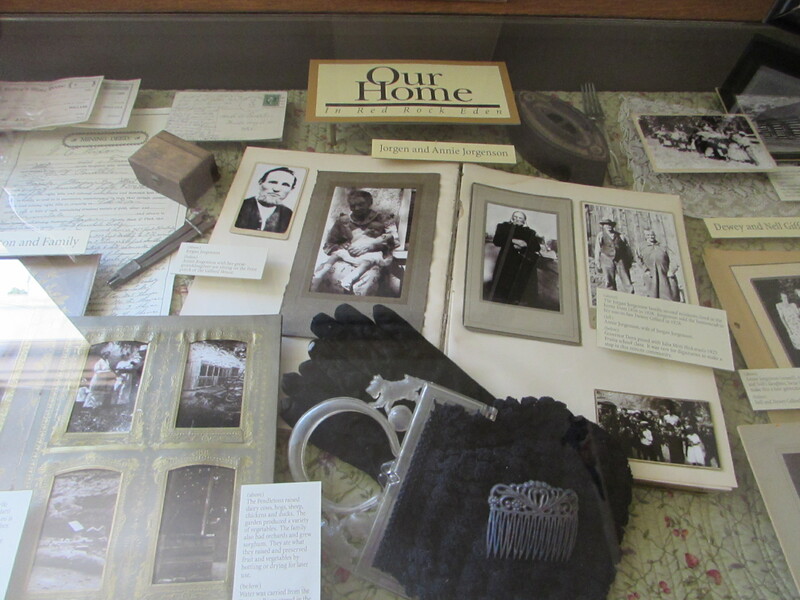 The consolation prize was that there was a small exhibit on the history of Fruita in the Gifford House. 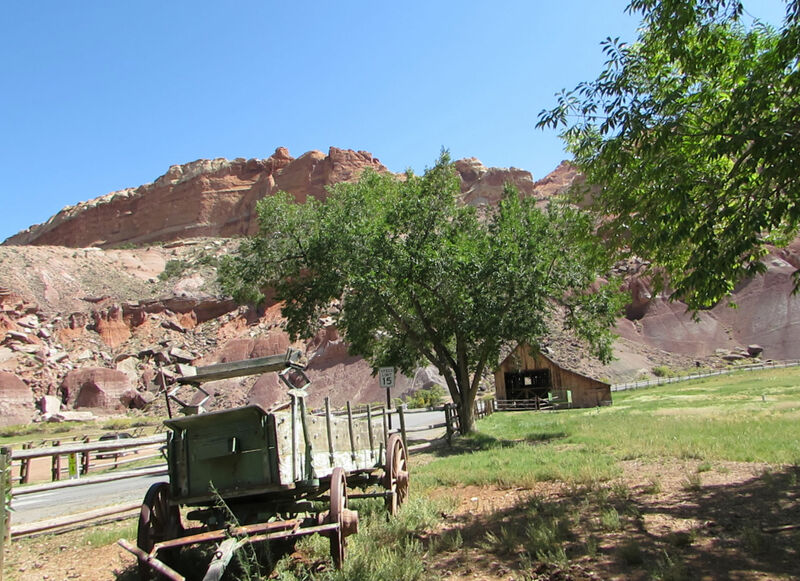 While visiting Capitol Reef, we stayed in Torrey, at a funky (in the 1960s sense of the word) motel called Austin’s Chuck Wagon. There’s a shop on the first floor of the building, that sells groceries and camping supplies, with a deli in the back. The deli is where we got satisfying and very cheap breakfasts and sandwiches to take on our hikes. The motel room we were in was on the second floor, above the store. It was old and worn, with a musty smell (which the overhead fan took care of), but perfectly clean and acceptable. It was all they had when I’d made reservations, and for less than $70 a night, we weren’t complaining. I’d definitely stay there again, but only if I could get a room in their much more modern building, behind the store. One of the children who commented on the space man eating fries, at the petroglyphs, belonged to a woman with an unusual look: bald with tiny tuffs growing out; what I think of as the “baby bird” look. That look is familiar to me because a few months ago, I was that woman. So here’s my self-disclosure, which actually is relevant to this blog: I have breast cancer. I was diagnosed last November and I’ve been in chemo ever since. That’s why I haven’t written much — because I was shackled to my oncologist and the chemo clinic for the first half of 2017 and couldn’t travel. It’s also why my hikes were limited to short and flat trails. But I’m now free to move about the country, so the posts are starting up again. A few months ago, when I was the bald woman with the baby bird tuffs of hair, I was at the Newspaper Rock petroglphys at the Petrified Forest when a woman came up to me and asked if I was having chemo. She shared that she’d had it five years ago and lost her hair. “And this is how it came back,” she said, pointing to her shock of bright purple hair. We had a laugh before she shared more sobering news: the cancer had metastasized and her doctors had given her a few months to live. She and her husband were spending whatever time she had left touring the country. I didn’t share that story with the woman at Capitol Reef, or her husband, young son, and parents. We spoke for a few minutes about hair growth, wished each other luck, and parted ways. It’s totally Twilight Zone that both these encounters happened while viewing petroglyphs at national parks. So I’m dedicating this post to Sharon from the Petrified Forest, and to the woman (whose name I wish I’d asked) at Capitol Reef. May their national park travels continue for many, many years to come. Gallery | This entry was posted in Utah. Bookmark the permalink. Stay positive and keep hiking! My husband just had his bladder removed due to cancer. The follow-up tests came back negative, so we’re (cautiously) optimistic. He’s a couch potato. Exercise is a huge part of recovery, so I figure you have an edge on the disease. Best wishes. Glad things look well for your husband. Best wishes to both of you.